The dynamic duo behind Icon's Criminal is back with Incognito, an imaginative examination of a different kind of crook. With a huge body count and dozens of high profile heists to his name, Zack Overkill was one of the best-known super villains of his day. But such rampages always seem to carry a giant-sized price tag, and for Zack, the time has come to pay the piper. When we're first introduced, Zack has adopted a new surname, a new location and a new job as a lowly paper-pusher, all thanks to his spot in the witness protection program. But how will he react when many of those same old urges begin surfacing once again, threatening the very foundations of his new life? Ed Brubaker spends much of this premiere issue laying the groundwork for what's to come. He's introducing us to the cast, he's walking us through Zack's history, and he's establishing just how big a lifestyle change this is for the former super baddie. Like many of Brubaker's leads, Overkill isn't an extremely likeable guy. He's shady, conniving, and spoiled. Because he had it so good before the abrupt ending of his previous life, he's never going to be happy as a mere cog in the grand machine of modern society. And though he is such an irritating individual, it's Zack's unhappiness with an average existence that connects him with the reader. While most of us can cloud our minds and expectations enough to accept our roles as worker bees, I'd imagine none are truly content with their post in life. We want to be special, to do what we want rather than what we're told, and though he goes about it in objectionable ways, that's all Zack is after, too. 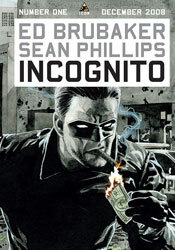 Incognito is just the latest in a long line of superb contributions from artist Sean Phillips. Where Criminal offered a fairly singular tone of grit, shadows and grime, the new series provides him the chance to showcase his versatility. Zack's life supplies a good mix of flavors, from the sterile, repetitive confines of his day job, to the sad, desperate décor of the singles bars he frequents and the filthy, grimy alleyways he visited as a super villain. Phillips provides solid visuals in each scenario, subtly shifting his style to match the tone set by Brubaker's storyline. I also remain constantly impressed by how much Phillips can do with a minimum of linework. Like Mike Mignola, he's developed that perfect eye for the very point where simplicity meets legibility. His work is no more complicated than it needs to be, but at the same time lacks neither depth nor description. It's just right. This is just another chapter in what's sure to be a long and fruitful collaboration between Bubaker and Phillips. The pair have worked together long enough for their familiarity with one another to really pay off, as was evident when Criminal really started to take off, and for the most part, it does so here. Incognito provides a cast that's instantly identifiable, a conflicted, complicated lead character and a fresh scenario, but at times it feels like Brubaker is straddling too many genres at the same time. I'm sure the series will really grow wings by the end of its first arc, and even at the moment it's quality reading, but it's not entirely sure of its identity just yet. Borrow it at the very least, it's very good material but doesn't quite match the intensity of their preceding work.